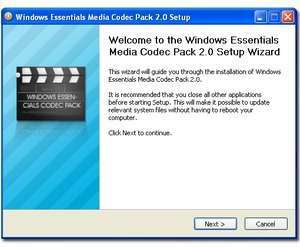 Windows Essentials Codec Pack is one of the most comprehensive collection of Media Codecs, Filters, Splitters and other tools that will enable you to play 99% of all the movies, music and flash files you download off the internet. Windows Essentials Codec Pack also currently includes a set of powerful filters that can enhance the video quality as well as audio quality and it comes complete with an automatic update service that will keep your PC up-to-date with the latest software upgrades as soon as they become available. For security reasons, you should also check out the Windows Essentials Codec Pack download at LO4D.com which includes virus and malware tests. Additional screenshots of this application download may be available, too.